My former editor Andrew Wheeler used to delight in sending me books he knew would cause me great pain. 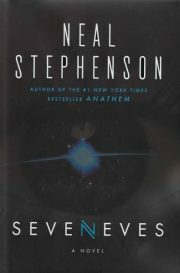 He would have, I suspect, been smiling very cheerfully had he had the opportunity to send me Neal Stephenson’s sprawling Seveneves, because it combines Stephenson’s traditional weaknesses—intrusive infodumps, shaky plotting, resolutions that feel less like endings than the moment the author got bored typing—with a host of new ones, like an almost Jack McDevittesque grasp of deep time. One day, the Moon explodes into seven large fragments and a host of tiny ones. Maybe it was aliens. Maybe it was a passing primordial black hole. Maybe it was an author who couldn’t be bothered to come up with a plausible scenario. The important thing is that scientists soon realized that a process analogous to Kessler Syndrome would turn a handful of large fragments into a vast cloud of smaller pieces. Enough of these fragments would impact the Earth to scour the planet clean of all life. The good news is that this will not happen immediately (or this would have been a very short novel instead of the behemoth that it is). The bad news is that it will happen all too soon, in two years or so. Everyone on Earth is doomed.